Amazing - only bite sized. 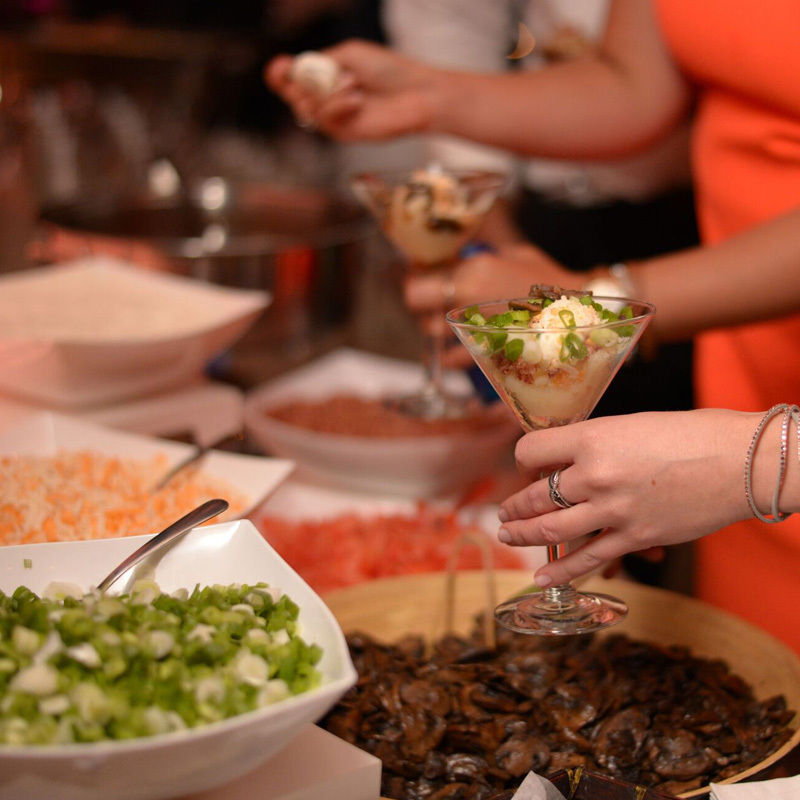 Get the party started with our wide array of appetizers - there's something for everyone. Hors d'oeuvres, amuse bouche, canapés, finger foods, call them what you will, at Mercer's we elevate the appetizer to a new art form of flavour and presentation. Our wide selection of meat, cheese, vegetarian, fruit, charcuterie and pastry creations ranging from classic to globally inspired, will satisfy and impress your guests. We dare you to stop at just one. Beautiful plate presentations of unique and flavourful hors d'oeuvres are hand delivered by our professional servers. Your guests will appreciate the attention to detail, friendly service, and the amazing food. It doesn't get any fresher than this. Our talented chefs prepare the food right in front of your guests. From sushi to flambé desserts (the bananas foster is to die for), your guests and your taste buds will thank you. These creative food stations are a big hit at any function. A table full of fresh flavourful ingredients allow guests to create their own appetizer to their tastes. Fun and delicious, they're perfect for midnight meals. Bacon Wrapped Perogies - served with dilled sour cream. Chicken Skewers (GF) - flavours change seasonally. Italian Caprese Salad Skewers (V) (GF) - fresh cherry tomatoes and bocconcini cheese, marinated in basil pesto, and drizzled with balsamic glaze. Seasonal Vegetarian Crostini (V) - crisp crostini topped with creamed feta cheese, diced roasted vegetables and red lentils. 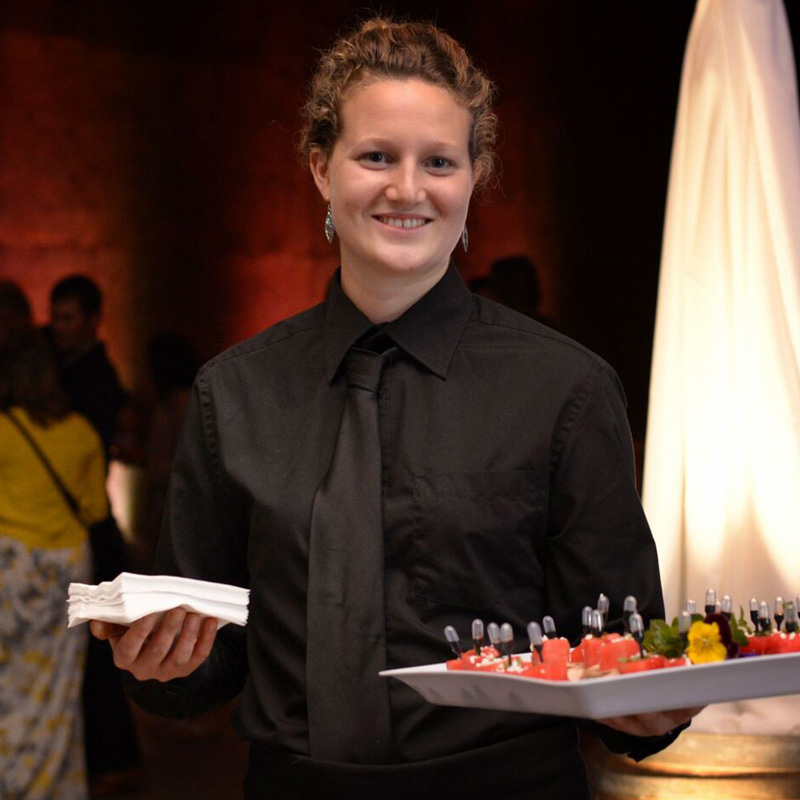 Watermelon Stacks (GF) - cubes of cool watermelon topped with feta cheese and fresh herbs; served in a bamboo boat with a pipette of balsamic glaze. Shrimp Shots - served in an individual shot glass, with cilantro and sriracha aioli, garnished with fresh cilantro. Seasonal Flatbread - puff pastry flat bread with cinnamon roasted butternut squash and feta cheese, garnished with pumpkin seeds. All Beef Meatball Skewers - with cranberry BBQ sauce. Asian Chicken Dumplings - tender dumplings stuffed with veggies and chicken lightly pan fried and served with an Asian dipping sauce. Bacon Wrapped Perogies - served with sour cream. Vegetarian Samosas (V) - stuffed with potatoes and veggies flavoured with mild Indian spices. Seasonal Vegetarian Crostini - crisp crostini topped with creamed feta cheese, diced roasted vegetables and red lentils. Chicken Skewers (GF) - with pineapple and coconut sauce. Beet Hummus (Vegan) - beautifully coloured humus with a hint of sweet beet flavour served with crisp pita chips. Italian Caprese Salad Skewers (V) (GF) - fresh cherry tomatoes and bocconcini cheese marinated in basil pesto drizzled with balsamic glaze. Beef Meatball Skewers - with a cranberry BBQ sauce. Roasted Vegetable Baguette Bites - with roasted peppers, zucchini & onions. flavoured with a roasted red pepper spread. Meat Lovers Tortilla Rounds - carnivores delight! Tri-coloured tortillas with roast beef, ham and pastrami, flavoured with mustard spread. Italian Caprese Salad Skewers (V) (GF) - fresh cherry tomatoes and bocconcini cheese marinated in basil pesto, drizzled with balsamic glaze. Dessert Platters - with an assortment of Mercer's most popular squares. Trio of Dips - includes hummus, tzatziki, roasted red pepper dip, pita chips, celery sticks & baby carrots.